Jacobson trails are mostly dry, though still damp in a few higher elevation locations. Please avoid using muddy trails to prevent damage. 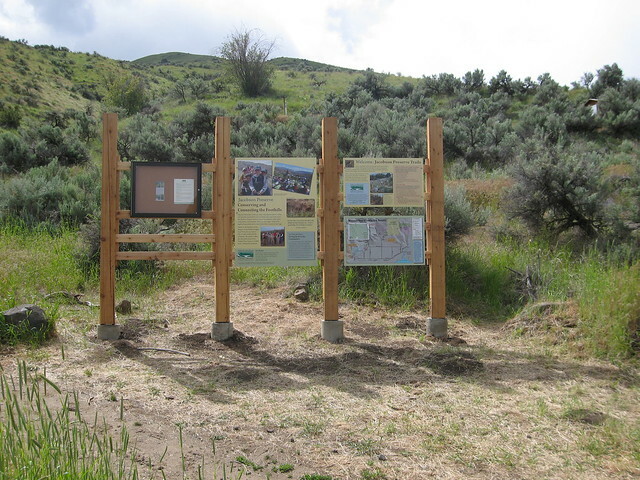 The Jacobson family left a permanent legacy to the Wenatchee community when it donated 35 acres of prime shrub-steppe habitat in the Wenatchee Foothills to the Land Trust. The hiking-only loop is a great short work out through amazing views and great spring wildflowers. This is a great route for a quick bike ride or trail run. Tack this upper loop onto your hike for additional fun! This is a great trail where you can approach Saddle Rock from the south. This trail crosses private property so please travel respectfully. Follow Western Ave to its southern most extreme until it becomes Canyon Number 2 Road. Take the 1st left onto Skyline Drive. After 500 feet, the road takes a sharp left turn. Jacobson preserve sits above that curve. Parking is available to the right in the WRAC parking lot. Please park in designated spots along the fence on the north side of the parking lot.